As there are numerous brands vying for the customer’s attention, you should find effective ways for your product to shine! Definitely, there are many ways that you can differentiate your brand from others. One simple way is to make the packaging excellent and outstanding. Product packaging plays an important role in marketing your products. Aside from keeping your product safe, the packaging can be your effective marketing tool. One of the best and safest way to use is the glass bottle. This type of packaging is ideal to use as storage for food and beverage products both for home and commercial use. 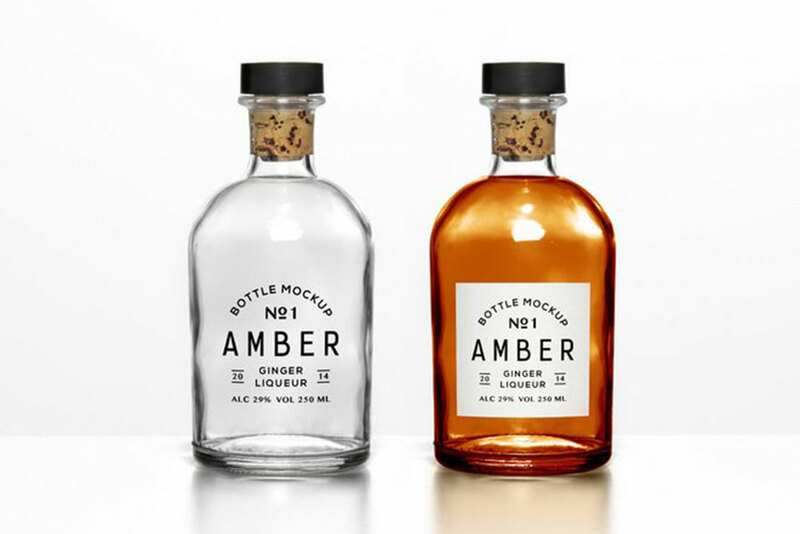 If you want your products to have wonderful labels, you must pick from this list the best glass bottle mockup that will suit your needs. Glass bottles are indeed timeless, classic, and safe. It can protect well your product and can make a significant difference from other brands. Moreover, this type of packaging can well preserve the purity of taste and keeps the consumers away from harmful chemicals. As plastic bottles contain hormone-disrupting chemicals, like BPA or phthalates, glass bottles are indeed most preferable. That’s why there are ample resources you can find for evaluating the label designs on a glass bottle. Hence, we’ve handpicked this list of glass bottle mockups for your project testing and presentation. Having the finest glass bottle mockup is indeed very helpful for designers and entrepreneurs. So, whatever product label you want to create, you need to check out this collection of glass bottle mockups. In this list, you can find bottles for juices, spaghetti sauce, drinking water, olive oil, jams, and many others. So, see which glass bottle mockup you will grab for your next project. Glass bottles are one of the best, safest and chemical-free containers. They may be fragile but when it comes to preservation, they’re one of the most effective storage. If you want to see your packaging label in a glass bottle, you can use this awesome mockup. Here’s a Glass Bottle PSD Mockup – Available with Useful Features. This mockup features a bottle with a hang tag attached to it. This is best to use for branding or any product presentation using a bottle container. You can insert your designs into the hang tag via the smart object, change the color of the elements and use a photo filter effect as well. 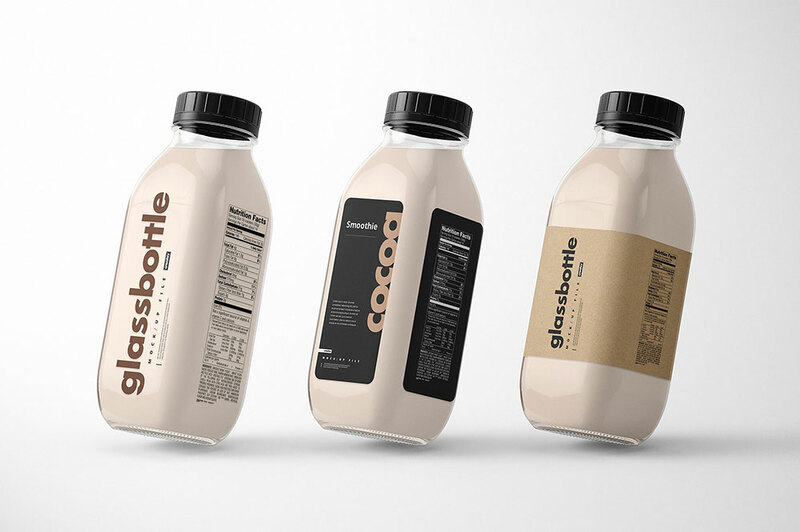 One of the best packaging types for dairy products is the glass bottle. With this type, your dairy products will have a visual appeal. Furthermore, it’s much more sophisticated compared to plastic and can really make a shelf look great. 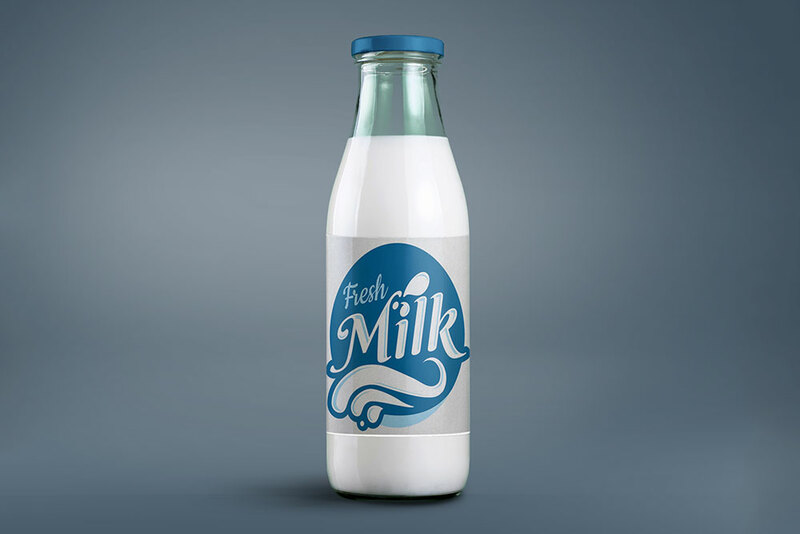 So, if you’re working with a label for your glass product, you must not miss this Free Milk Glass Bottle Mockup. Apparently, you can insert a label on the glass bottle, change the bottle’s cap so it would match with your designs and change the color of the background. Also, this mockup offers photo filter effect that you can use to filter the scene. Glass is a non-porous material that does not hold any tastes or flavor of previous food stored in it. In addition, it doesn’t have harmful chemicals that can contaminate the liquid contained with it. So, aside from the security it offers, you can also recycle it as long as it’s intact. 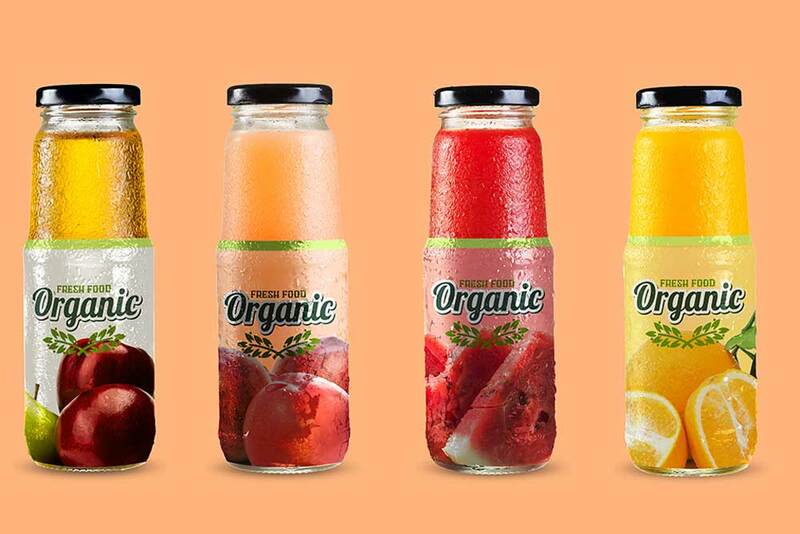 Here’s a Free Download Fruit Juice Glass Bottle Mockup that is useful for testing the label designs. 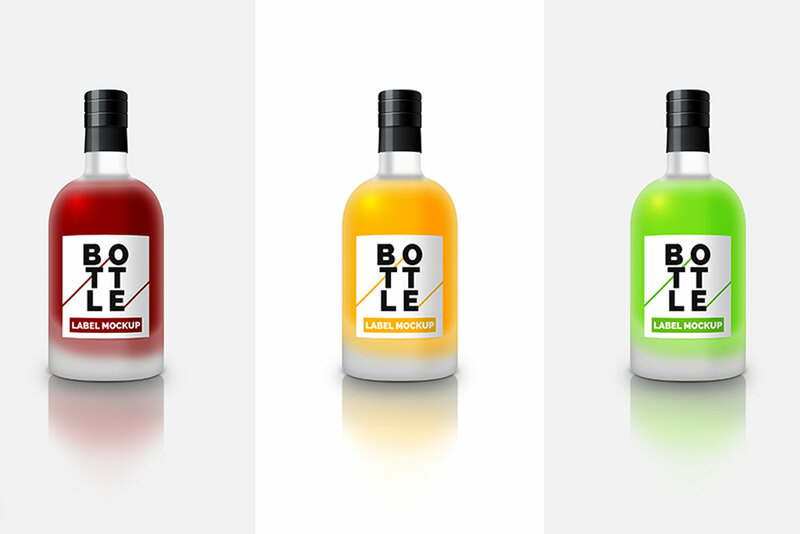 Specifically, this mockup allows you to exhibit four glass bottles to represent different juice flavors. Moreover, you may also move or remove bottles in the scene if you need to. The background is also customizable if you wish to alter it. Today, more people are getting concern about their health. So, they see to it that the products they will be using for themselves and their family are harmless and chemical-free. This is why glass bottled products are in demand. These glass bottles are made from natural materials such as limestone, sand and many other elements making it safer storage than others. If you’re working with glass bottle labels, you should pick this Glass Bottle Mockup. It features two glass bottle packaging, a stand-alone glass bottle, and a handheld glass bottle. Specifically, you can change the color content of each bottle and its background so it would match with your designs. If you wish your liquid products would look fresh longer and never goes out of style, then you should opt for a glass bottle packaging. Also, you can be sure that your product will stay safe from chemical contamination. 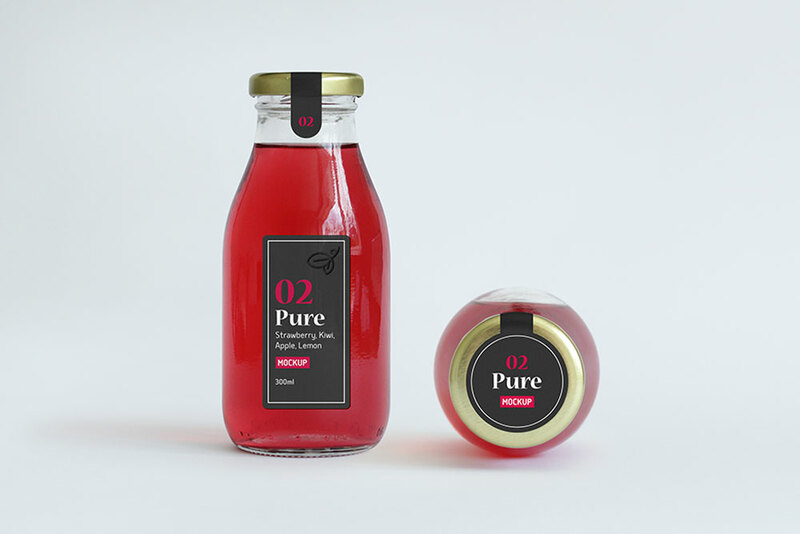 If you wish to see your labels in a lifelike manner, you can pick this Glass Bottle Juice Mockup. 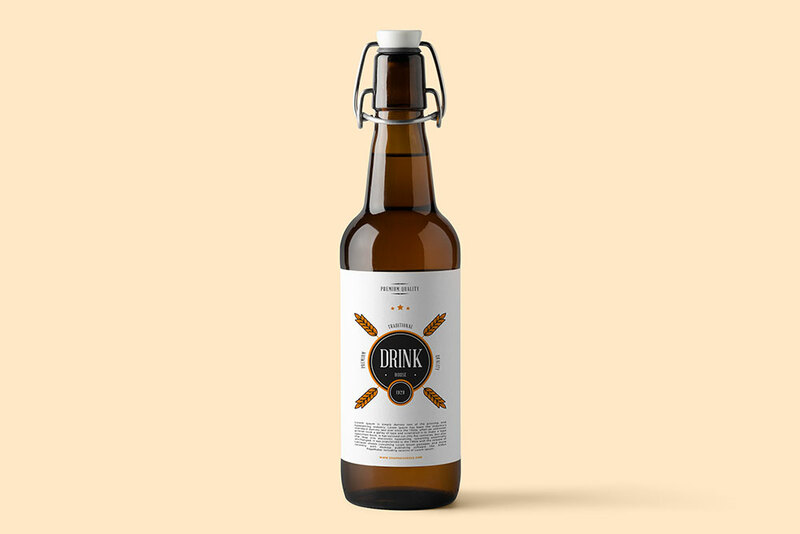 Particularly, this mockup lets you add your bottle labels using the smart object layer. Also, you may customize the color of the cap and the liquid content to present different flavors of your juice products. If you like to enhance your designs, you can use the filter feature this scene. Beverages are usually stored in plastic packaging. Although it’s more beneficial for businesses it may not be so for the consumers. These plastic packaging may contain chemicals that may leach the liquid content. Therefore, glass bottles are safer and are preferable than those plastics. If you want to use it for your liquid products, you can grab this Free Glass Bottle Plus Black Cap Mockup. It features three glass bottles that are fully customizable. Basically, you can change the color of the bottle as well as the label. Of course, adding your designs won’t give you problems as it offers easy design integration through smart objects. With this mockup, editing won’t give you problems as each element are placed in properly named folders and layers too. Glass containers are undeniably great storage for food and drinks. It effectively maintains the quality of the product better than other packaging types such as plastic. So, there’s no doubt that it’s an excellent alternative to use for different liquid products. If you plan to use glass bottles for your brand, you must have this Free Glass Bottle Plus Cork Mockup in PSD. It features two glass bottles with cork caps – the left bottle displays an empty bottle while the other exhibits your product with content. Apparently, you can insert your designs using the smart object layer. 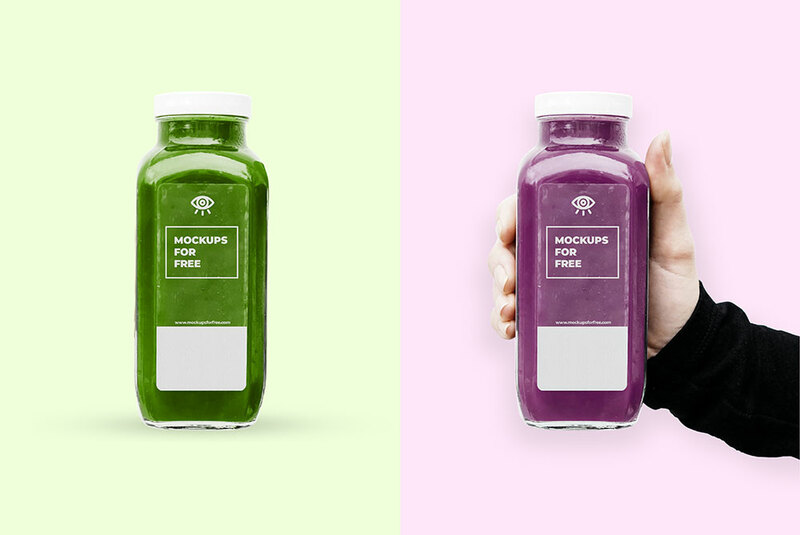 This mockup lets you edit the color of the liquid content so as to represent various flavors. It’s a high-resolution file with 4000×3000 pixel dimensions. Perfumes enhance the mood and can reveal different personalities. It may even boost confidence as you smell good and feel pretty or handsome. That’s how awesome and powerful perfumes are. If you’re an entrepreneur or a designer who’s working with perfume bottles, this mockup might help you yield marvelous results. Here’s a Free Elegant Glass Bottle Mockup in PSD that features a small glass bottle that you can use for perfume packaging, wine or any other suitable liquid products. It lets you insert your designs on the label and make a wonderful presentation through the smart object layers. Olive oil is known for its healthier components compared to other types of oil. If you look for its health benefits on health blogs you’ll find numerous and interesting benefits. One of the few benefits it offers are the antioxidants, anti-inflammatory properties, reduction in the risk of coronary heart disease and a lot more. With these in mind, we don’t need to wonder why this type of oil must be stored on containers that are safe and secure. One of the most common ways is to use glass bottles. 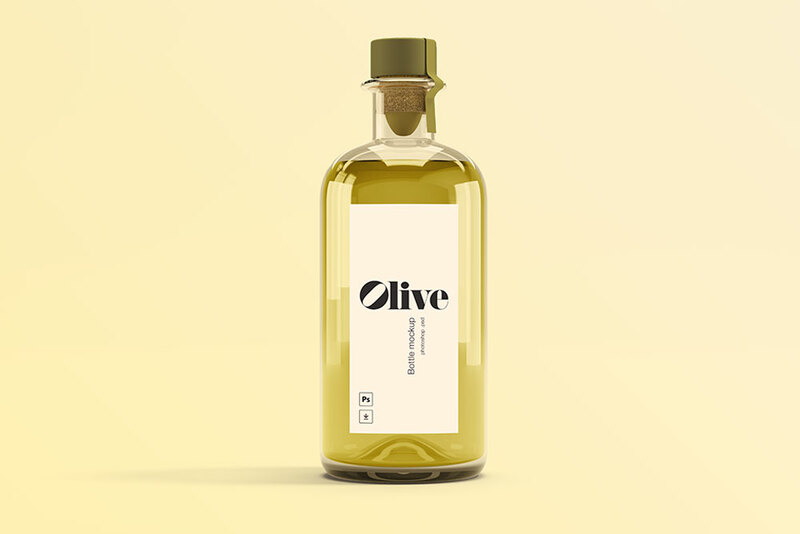 If you think you need to redesign your olive oil labels, this mockup is a must-have! With the use of use of the smart object, you can insert your logo, image or taglines easily. Also, it lets you customize the color of the bottle and cap to your own preferences. 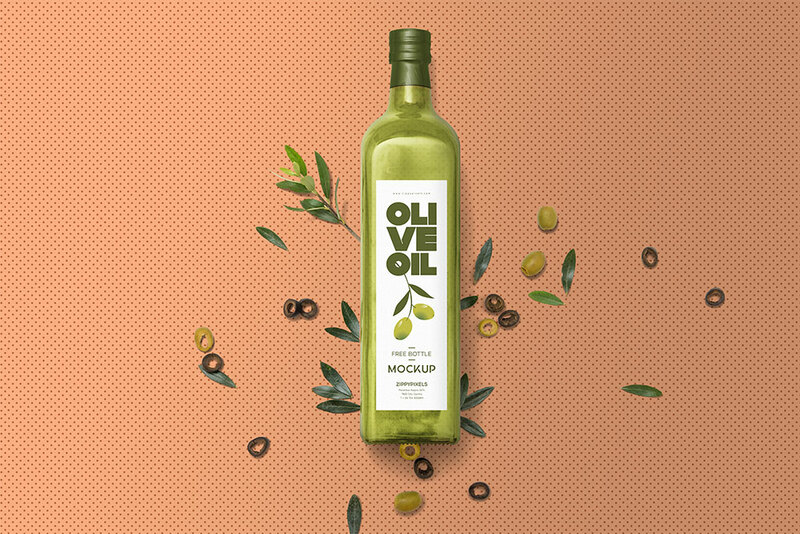 If you would like to change the background and remove the olives, just look for its layer and freely edit it. Glass packaging is a perfect storage choice for people who love to stay healthy and safe. That’s why different brands must at least have their bottle packaging versions of their products instead of all plastic. As this plastic may contain high levels of BPA, liquid products may be at risk of contamination. Well, you might want to check out this freebie. This Glass Bottles with Wooden Caps Free Mockup is an excellent choice. You can use this for logo presentation on a glass bottle or for branding. It contains the smart object for inserting your designs with ease. It features three clear bottles with wooden caps displayed in a perspective angle. 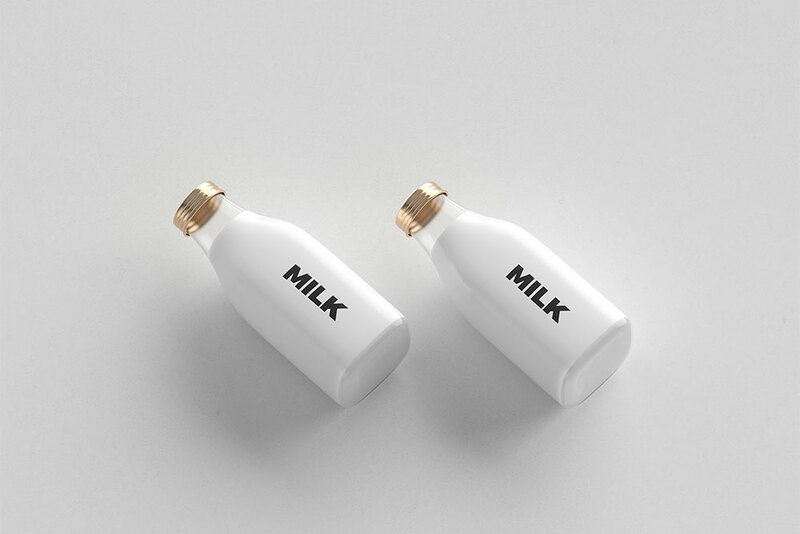 If you’re planning to use glass bottles for your liquid dairy products, you must have glass bottle mockup for testing your design labels. Through mockups, you can evaluate your designs if they fit well on the bottle’s body. 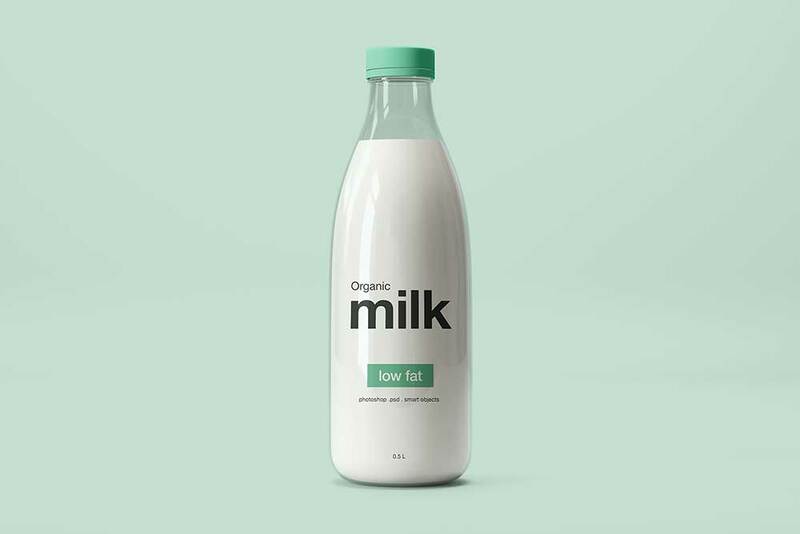 Hence, this Glass Made Milk Bottle PSD Mockup is a cool way to achieve a seamless label. It features a glass bottle with milk content. Apparently, it lets you apply your own artwork on the bottle’s body and change the color of the cap so your color scheme is clearly displayed. Who would dare to resist clean and chemical-free drinking water? In order to have such, you must have clean and safe storage. The safest way is to use a glass bottle. 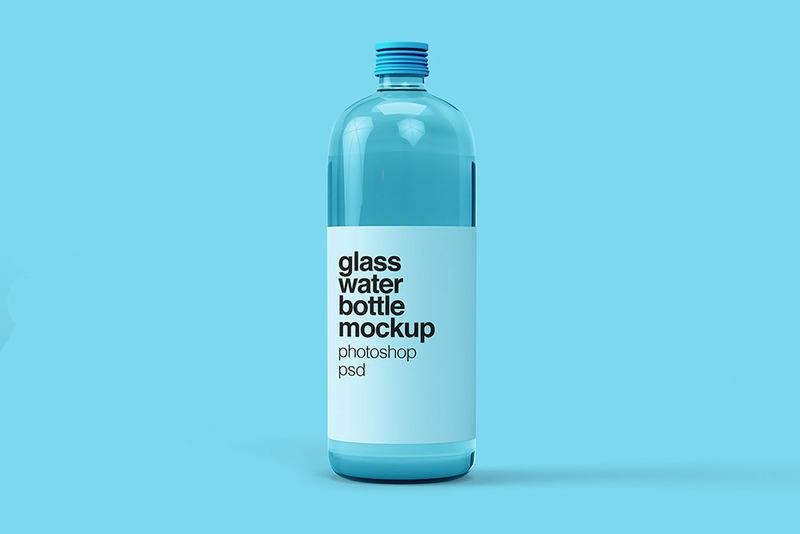 If you’re working with bottled water using a glass container then this mockup is for you. 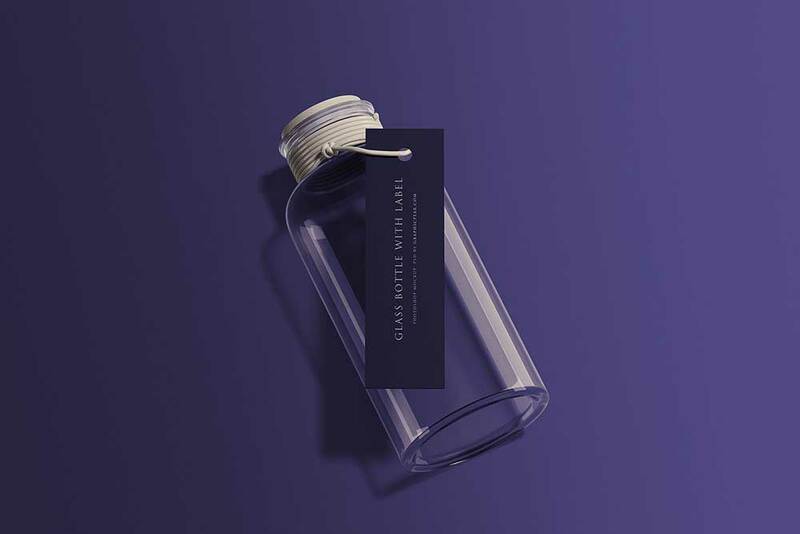 Here’s a Free Download Glass Water Bottle Mockup that you can take advantage of. It comes with the smart object so adding your own designs into the bottle is easy and fast. Specifically, you can add a label on the bottle and change the color of the bottle’s cap. Moreover, you can use the photo filter feature if you wish to enhance the photo. If you’re looking for the perfect mockup to test your packaging labels using a glass swing bottle, then you’ve come to the right place! This Free Glass Swing Bottle Mockup in PSD is essential for creating a wonderful bottle label. If you want to test your logo or branding designs this mockup is a cool choice. It features a glass swing bottle with customizable labels. With this mockup, you can test if the logo and other elements in your designs fit well on the contours of the bottle. If you want to change the background, it is also possible. Just locate the folder where the element is located and you can start editing without hassle. 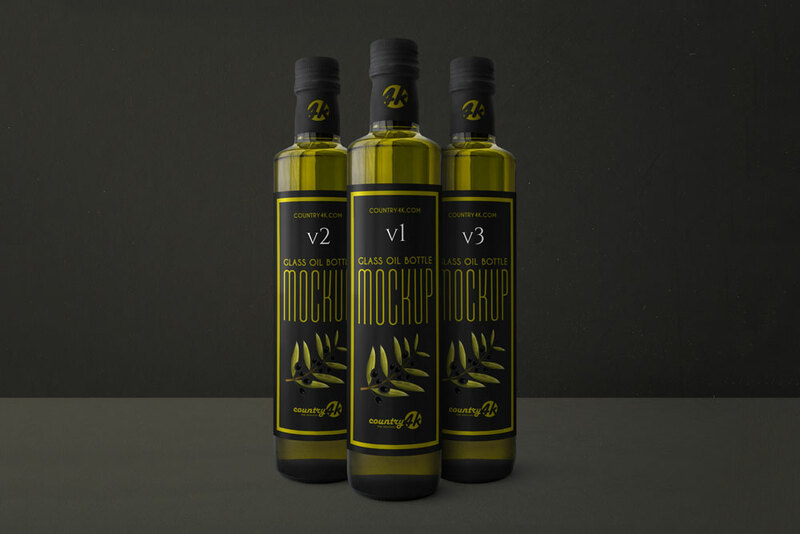 If you’re an entrepreneur having different types of oil products, then you really need glass bottle mockup in testing your packaging before it gets to the retailers and consumers. Ensuring that the quality of your product complements your packaging label is a must! So, why not pick this Set of 3 Oil Bottles PSD Mockup for your upcoming design presentation? It will not just help you finalize your designs but will aid you with your client presentation. It features three tall glass bottles for your oil products. You can add your labels on the bottle’s body and neck without difficulty as you use the smart objects in applying them. One of the most recommended and most healthy oil is olive oil. That’s why there are ample brands that are vying for the consumer’s attention. Therefore, if you’re in this line of business, you must not forget to grab the best mockup for your evaluation. 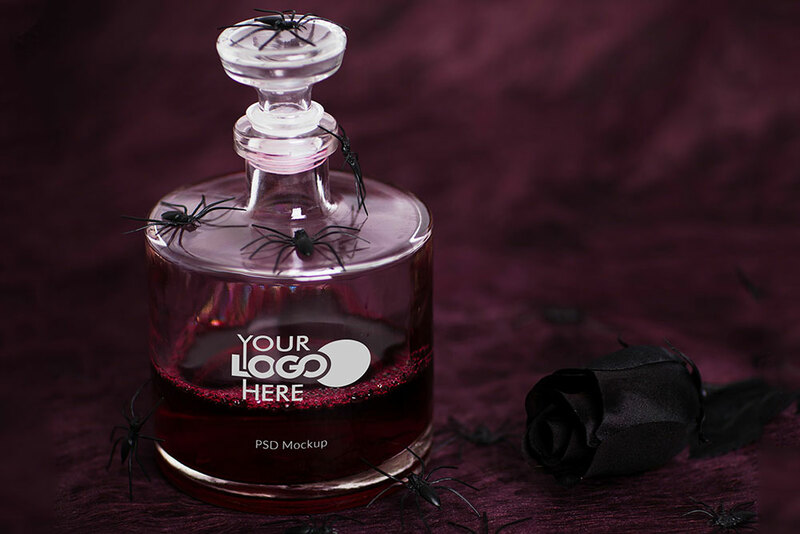 Specifically, this mockup allows you to add your own designs into the bottle easily via smart object. Also, you can change the color of the bottle’s cap, adjust the color of the oil, inner cap, label color, bottle color, and the background as well. If you need to use the photo filter effect, it’s also possible. If the background needs to be altered, you can just look for the layer where it is located. Preserving the flavor and taste of the liquid products is very much possible when you use the perfect and most suitable storage. The best way is to use the glass bottles. This storage is safe for any products like juices, milk or plain water. Here’s a Juice Bottle PSD Mockup Available for Free that you can grab for your personal and commercial projects. It contains two small glass bottles in different positions. Basically, you can showcase the bottle’s label, tab, and the cap too. As it comes with smart objects, inserting your designs won’t be so hard. 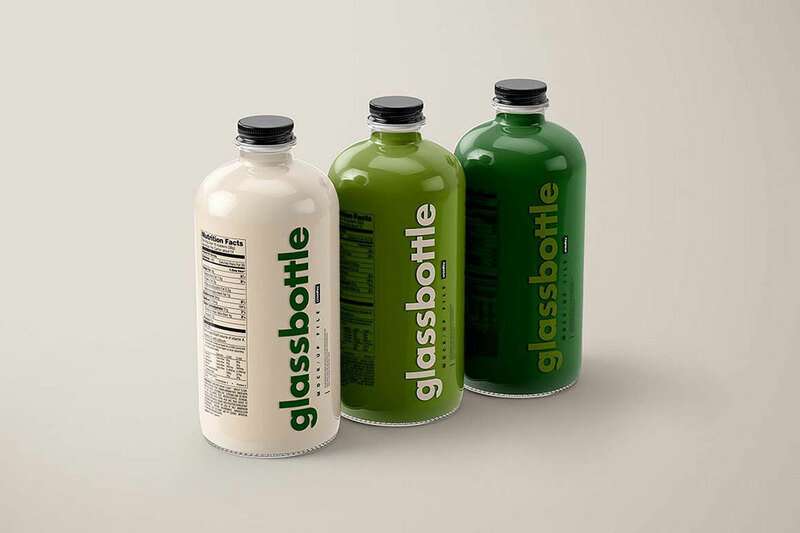 Glass bottles are perfect to use if you want your brand to have an eco-friendly concept. These containers are disposable and refillable. That’s why it makes a better packaging for both the environment and people. If you want to see your labels in a realistic manner, you must have this Free Customizable Versatile Bottle Design Mockup in PSD. This is useful for any type of beverage including oil, juice, beer and any other beverages. This pack lets you apply your label design on the bottle’s body and change the color of the liquid content so you can use it for different flavors. 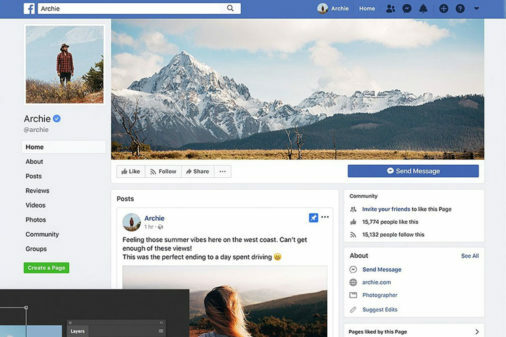 Just use the smart object and insert your designs with ease. In this modern era, products which are environment-friendly is a big factor that most consumers consider before purchasing. For liquid products, it’s best to consider the packaging type whether it’s safe for human and for the environment too. Indeed, glass bottles are guaranteed safe for such products. 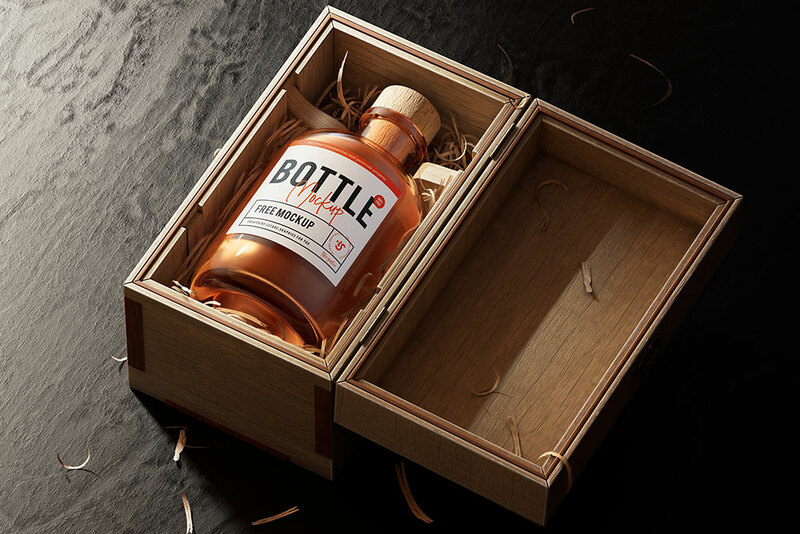 Here’s a Free Bottle Logo Plus Wooden Case Mockup in PSD that fits best for your bottled products. You can use this for wine, oils and other products. 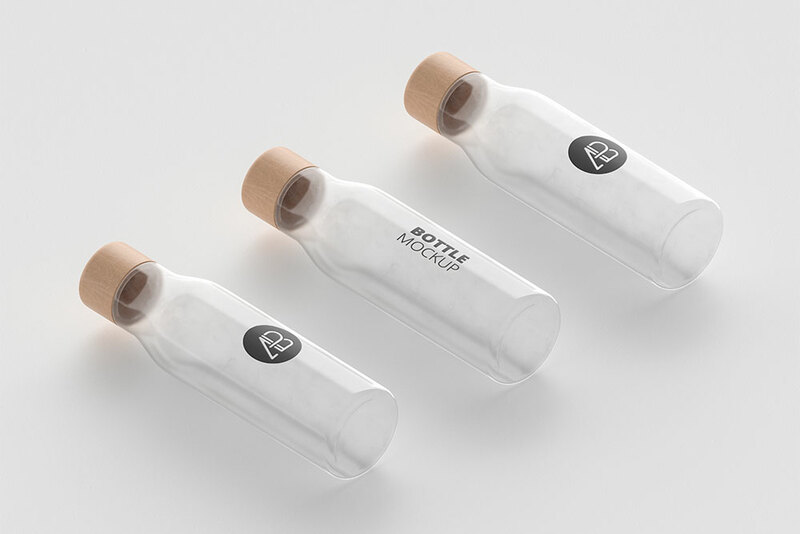 This mockup offers three different bottles – the black, brownish and white. All of these bottles are placed in a box where you can insert your label designs into the bottle’s body via smart objects. If you’re trying to promote your brand including jams to your consumers, make sure you have the right labels that will help improve brand awareness. By adding your logo into the bottles people will start to know and recognize your brand. 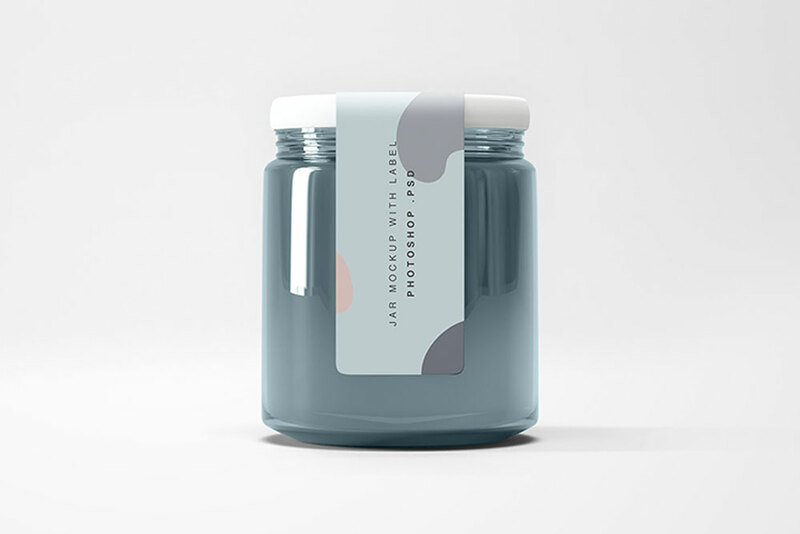 Here’s a Jam Bottle PSD Mockup that you can use for the evaluation and presentation of your labels. Apparently, this mockup allows you to exhibit three different flavors of jam products. Furthermore, you can choose from the three different colors for your bottle content. You may also change the color of the cap so you can match it with certain flavors. If you want to edit the background, it’s also possible. Vodka products are known to give health benefits to its consumers – the reason why it becomes so popular in the wine industry. Some of the best benefits are relaxation, stress reducer, disinfectant, antiseptic and many others. 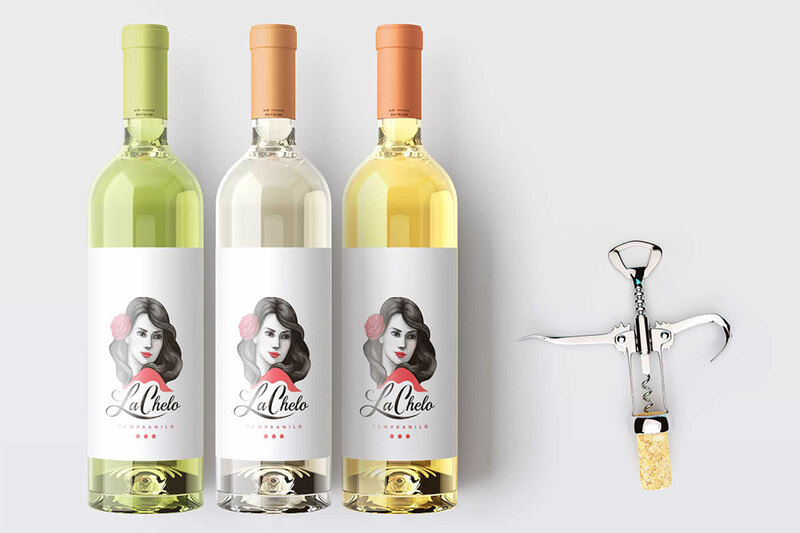 If you’re in the wine industry, you must have the best glass bottle mockup for your brand to stand out. 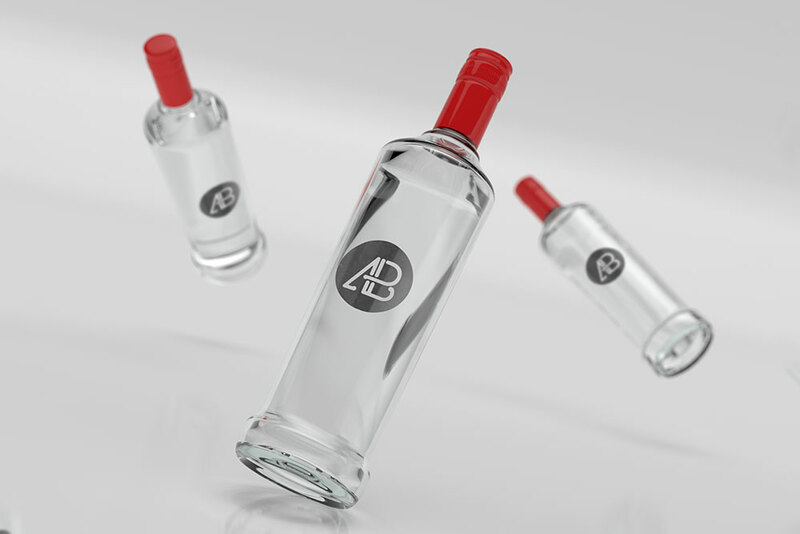 Here’s a Free Realistic Vodka Bottles Scene Mockup in PSD that will aid you in designing your labels. It features three similar bottles of vodka at different angles. Also, it contains a smart object layer for easy design integration. Despite the existence of plastic containers, glass bottles are still the best, classiest and safest. Whether your product is in liquid form or powder, glass bottles will keep it secure and fresh. Therefore, you should not neglect to have your food or beverage products to be stored on glass bottles. Here’s a Glass Jar PSD Mockup that is ideal to use for your food products including jams, powdered condiments, and other essential products. It comes with fully customizable elements to unleash your creativity. Apparently, you can change the color of the bottle’s content and its background to match with your designs. This mockup also offers photo filtration of the scene for a cool and realistic look. Wine is part of almost all occasions. It’s even a common thing that is found in almost all homes. These wines are ideal for wedding, birthdays, anniversaries and many other special occasions. If you’re in need of a glass bottle mockup for your wine products, you must not miss adding this to your collection. Particularly, this mockup showcases three bottles of wine products. With this pack, you can exhibit different types of wines. In particular, you can edit the color of the bottle’s neck to match with your label designs. For your brand to stand out, you must have high-quality and genuine products to offer. Also, you should make sure that the outside of the product matches the quality on the inside. 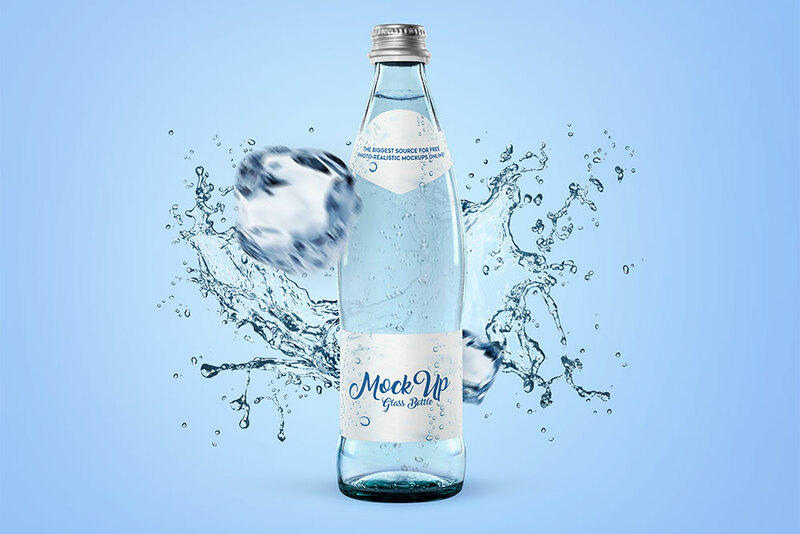 Well, you can ensure all elements are in place with this Free Bottle Mockup in PSD. It basically gives you the option to use the white bottle or the brown ones for showcasing different products. It can help you exhibit your logo or brand to a client for product presentation such as beer, olive oil or milk. Milk products need to have the safest and durable containers or storage for it to last longer. Yes, it can be stored on plastic but it’s not 100% safe. So, entrepreneurs, need to look for the safest way. If you wish to create your branding on a glass bottle, you can pick this Free Milk Bottle Packaging Mockup in PSD. It features a medium size glass bottle that can be customized to meet your needs. 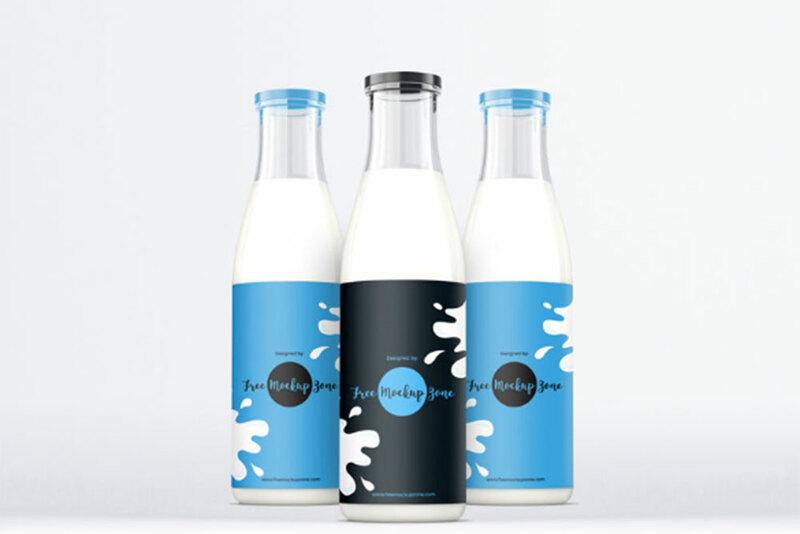 Moreover, you can replace the label design on the milk bottle and its cap via smart object layers. Also, you can customize the background color to match with your designs. Water is indeed very important to the human body. As water plays important roles, everyone must have an adequate and constant supply of drinking water to keep the body healthy. Hence, the bottled water business is prevalent. 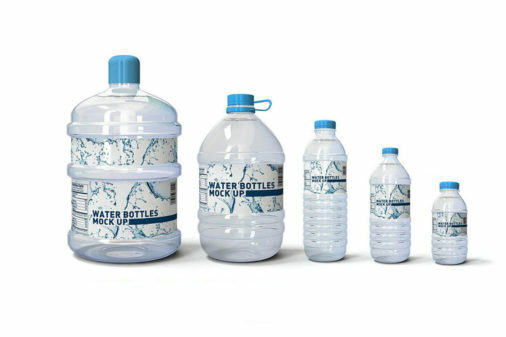 If you wish to polish your labels, you can grab this Free Water Bottle with Labels Mockup. It features a glass bottle that has a cool, refreshing, water splash effects. Apparently, you can add designs on both the upper and lower parts of the bottle using the smart object layer. Aside from the bottled water products, there are also fruit juices that are readily available in the market these days. As manufacturers think of chemical-free products, glass bottles have become popular too. 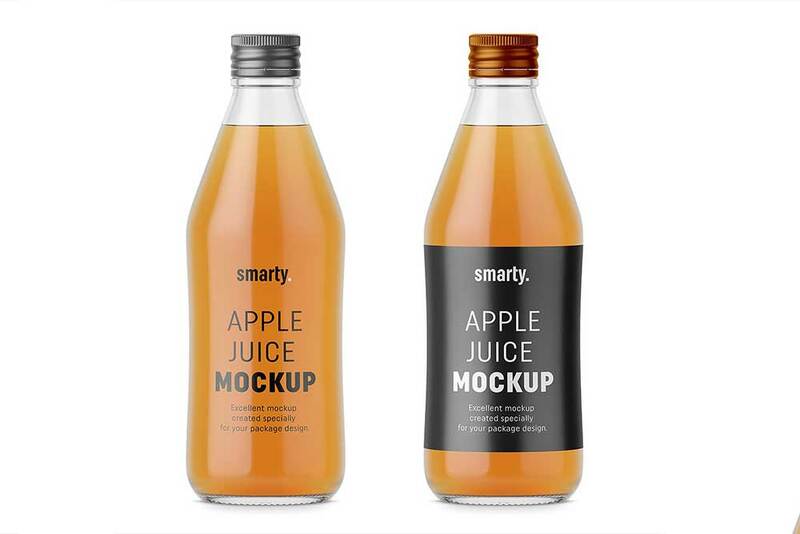 If you need to preview your packaging labels of apple juice products, you can choose this Apple Juice Bottle Mockup. It features a glass bottle with customizable labels, colors, and background. As the liquid color is fixed you can also use this for any liquid products that it fits best. Particularly, you can edit the color of the cap, add designs on the upper and lower part of the glass bottle using smart objects. Are you looking for the best mockup to test your packaging labels of mayonnaise, ketchup, tomato juice or sauce? Well, you better check out this useful mockup and let it display your packaging labels well. 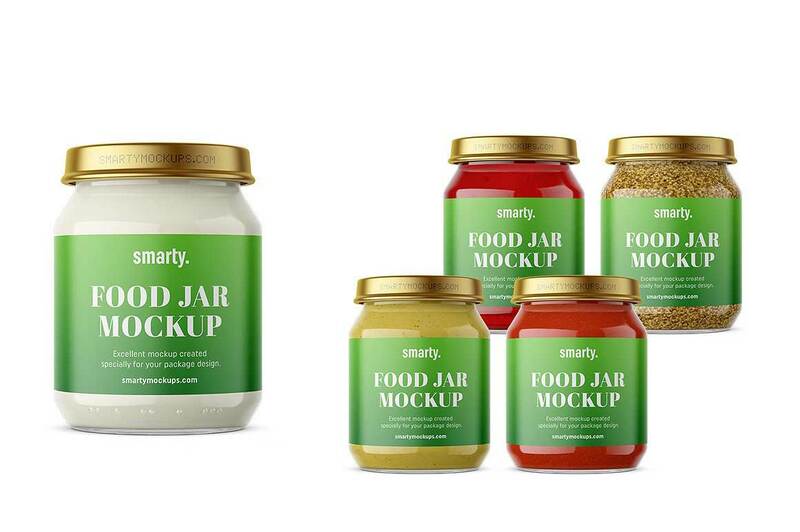 Here’s a Food Jar Mockup that is beneficial for your creamy food products or powdered ones. 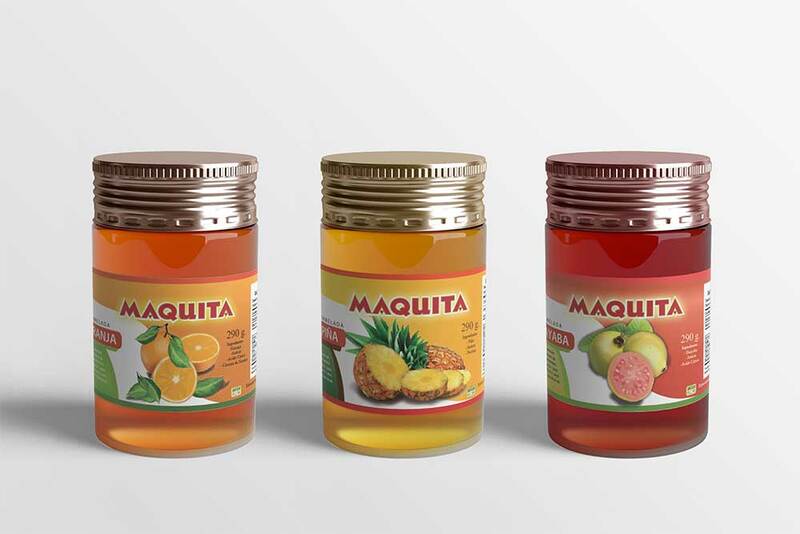 This mockup has four PSD files with different jars for different products. It has a mayonnaise jar, ketchup jar, mustard jar, and red jam jar. Moreover, you can edit the color of the elements in the jar and add your own designs through smart objects. You may also use the glossy cap or the metallic cap to enhance the appearance of your product. The packaging of your product need not be dull and boring. 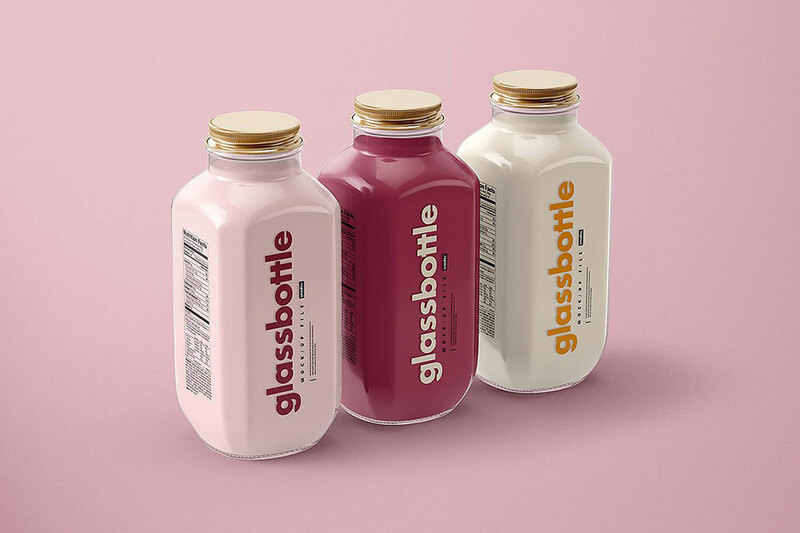 You can make it look excellent through glass bottle mockup that will help you remove the flaws in your designs. Here’s one that you should have for your upcoming projects. A Glass Bottle Mockup Set v.2 that features rounded glass bottles for any liquid products you will have. With this pack, you can easily check which part of your designs that needs improvement. This pack contains four PSD files with five different views of a glass bottle. Apparently, it lets you change the color of the liquid, bottle and label using smart object layers. The cap is also customizable. Glass bottles are a great option for keeping your products safe, tasty and fresh. In fact, it’s not just beneficial for the consumers but to the environment as well. So, we need not wonder if soon, these glass bottles will be more popular worldwide. Here’s a Glass Bottle Mockup Set v.3 that features square-shaped glass bottles in four different angles in PSD files. With this pack, you can change the color of the liquid content, cap, and background too. 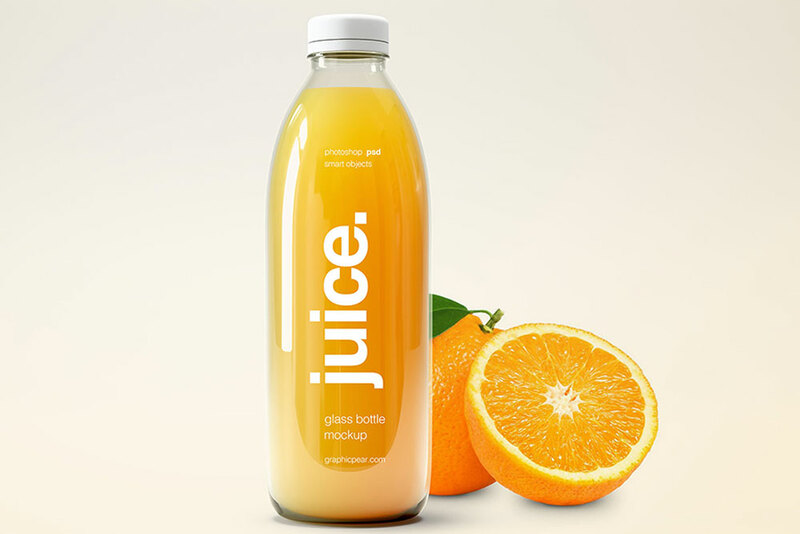 Looking for the finest glass bottle mockup for your newest bottled juice product? 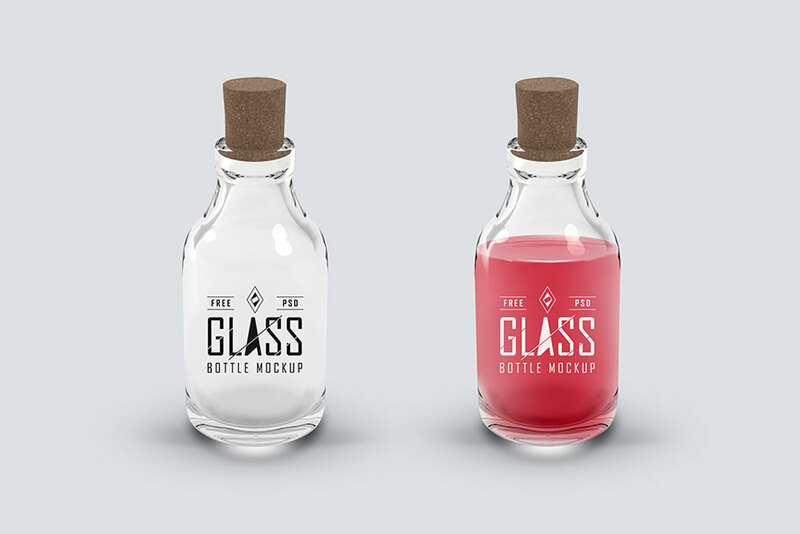 Why not pick this Glass Bottle Mockup Set v.1 and let it polish well your designs? This pack contains five PSD files with easy to customize elements. You can add labels using the smart object layer, change the color of the liquid, edit the bottle label and colors too. Moreover, you can custom the color of metallic and powder coated cap; change the background and everything you need to customize for your own design presentations.